The nominations are in - so who will be your 2019 person of the year? The nominations are in - and now the finalists for the 2019 Power 50 can be revealed. Part of the Mobile Industry Awards 2019 powered by TechRadar Pro, the Mobile Power 50 highlights the most important and influential figures in the UK mobile industry during the past year. The finalists for the 2019 Mobile Power 50 are listed below, and the voting is open NOW - so pick the person you think has really made a difference this year. 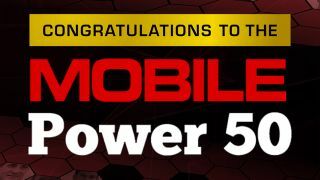 Nominate your choice for the 2019 Mobile Power 50 winner here! The winner, recognised with the Mobile Power 50 Person of the Year award at the Mobile Industry Awards on June 6th, is selected following in-depth interviews with key senior figures across the industry, from operators and retailers, to manufacturers and distributors. It rewards those individuals who inspire their businesses with their values, but also have influence beyond existing roles, serving as inspiration to the rest of the trade. To make the Mobile Power 50 list, an executive needs to be bold in their leadership and vision, and have exceeded expectations in the different categories we have chosen. For more information on the Mobile Power 50, or to get more involved in the Mobile Industry Awards 2019, visit the awards site here.